A paramedic is a person trained to give emergency care to people who are seriously ill with the aim of stabilizing their condition before they are transported to a hospital or any health-care facility. 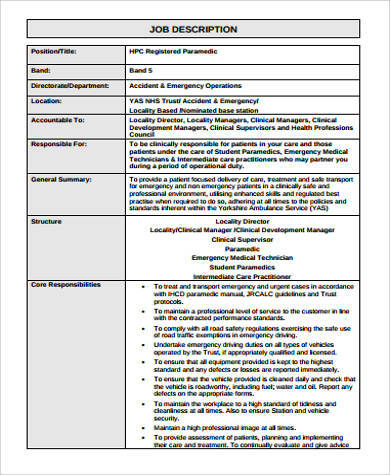 If you are a manager or head of a hospital, clinic, or any primary health-care institution with an emergency unit, then you must have be aware of the gravity of the responsibilities of a paramedic; for he/she stands between a patients’ life or death. 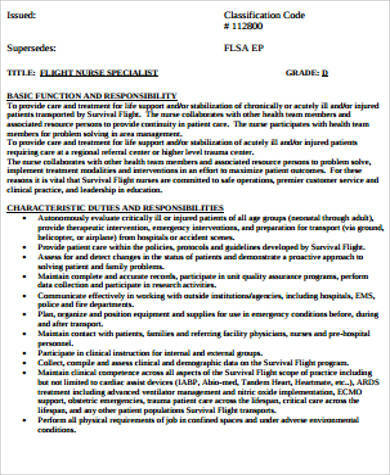 That is why, in order to hire the most qualified paramedic, you need to base your selection process on a job description. 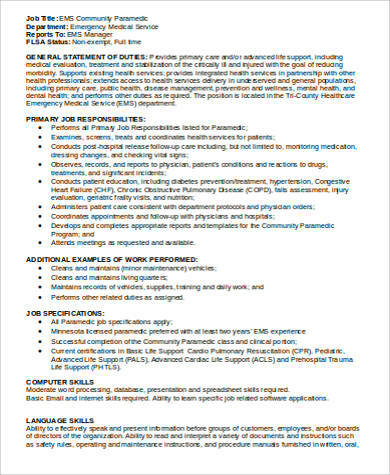 Moreover, you can use this job description as the barometer that ensures that your paramedic performs his duties excellently. 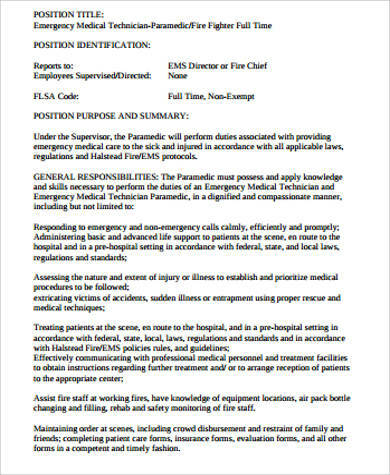 For your guidance, we have paramedic Job Description Samples that you may download for free. Scroll down below and select the one that suits your needs. A flight paramedic is the medical personnel who is in charge of providing high-quality pre-hospital advanced life support to the passengers of a plane in the event that a passenger would need medical attendance in the middle a flight. The life of the ailing passengers are on their hands since there is no access to any form of medical intervention or care while the plan is on flight. Diagnose passenger/patient’s condition and providing proper medical support to aid in the recovery and/or stabilization of their patients’ injury/ailment while transporting them to a qualified health-care facility. Assess the passenger/patient’s condition, administer medications, perform advanced medical care and/or possible on-site surgery. When deemed necessary, operates advanced medical machinery in order to ensure the health and safety of the patients. Maintains thourough patient care documentation. Ensures that he/she practices within his/her scope of practice as defined by the state regulating each airport/base. 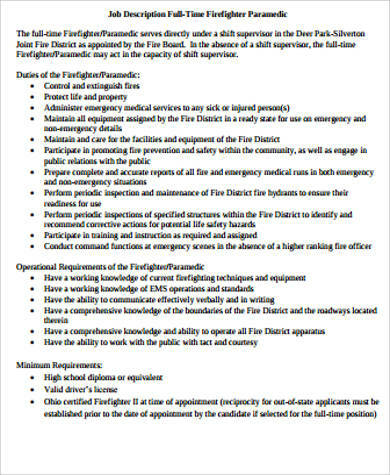 For more reference, you may also download our Firefighter Job Description Samples. Simply click on the link provided. 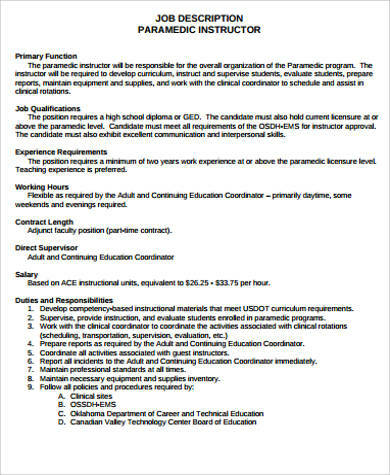 universities that offer paramedic courses and other variation of the emergency medical technology course. 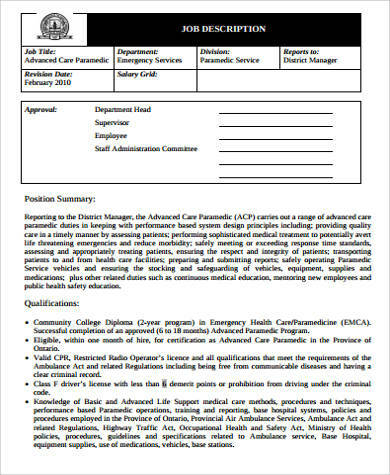 An ambulance paramedic is usually hired by large hospitals and other health-care institutions. These institutions maintain a 24-7 hotline for medical emergencies. To treat and transport emergency and urgent medical cases in accordance with the existing manuals, laws, and protocols to be followed by paramedics. 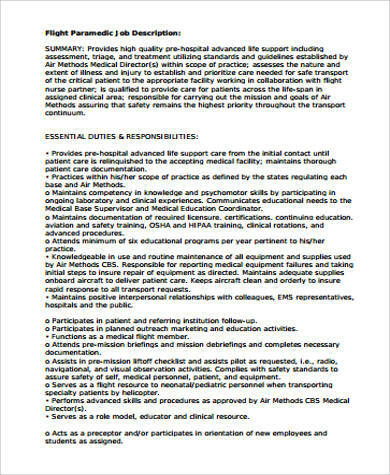 To maintain a professional level of service to the customer/patients in line with the contract’s performance standards. To comply with all road safety regulations exercising the safe use of road traffic exemptions in emergency driving. Undertakes emergency driving duties on all types of vehicles, especially the license vehicle that is registered as an ambulance/emergency vehicle. To ensure that all equipment used is kept to the highest possible standard. To report all defects and losses of medical equipment to the the hospital supervisor or manager. To constantly attend trainings and upgradings for emergency medical practitioners.